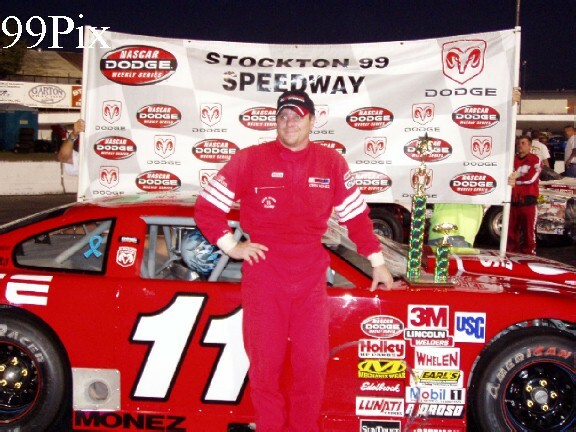 MONEZ SWEEPS HAVOLINE WESTERN LATE MODEL MAIN, ANDERSON JR.
STOCKTON, SATURDAY, JULY 23 -- Turlock's Chris Monez swept the HAVOLINE Western Late Model division in the number 11 STOCKTON DODGE Intrepid. 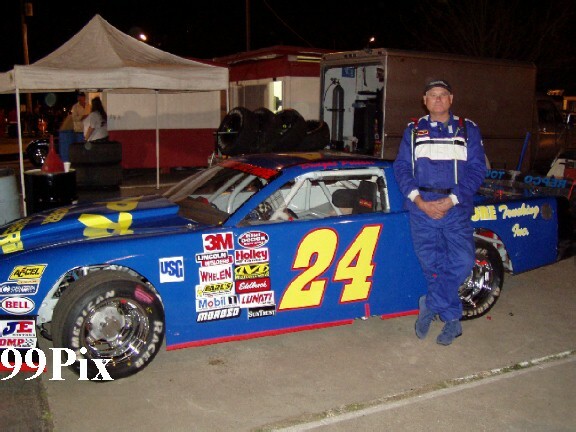 The invert put him in the fourth row back at the start, by lap-20 he had crept up on front-runner Allison Duncan, buried his car's nose half a car length into her tail for a few laps, then ran side-by-side with her through lap-38 when he took his first lead of the evening. 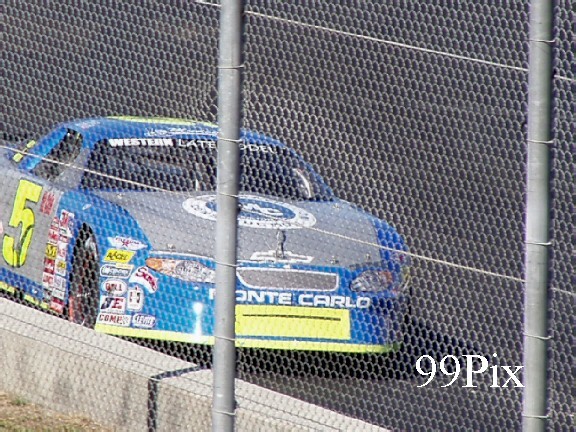 San Rafael's Duncan managed to pull back into the lead a lap later and hold it until lap-45. A caution flag flew in lap-46 that again pitted the two leaders side-by-side, when the green flag waved Monez jumped into the front and stretched his lead to the finish. Prior to the race Monez said that he hoped he would be talking about a win tonight, perseverance led him to such a conversation. "We'd been running real fast in my groove," said Monez. "This week my crew chief made some changes to the car that allowed us to run fast outside of it too, it worked." Monez gave some of the credit for his win to Duncan's talent. Duncan started the race two rows ahead of him, to finally take the lead he had to run door-to-door with her for more than 13-laps. "I gotta really give Allison (Duncan) a lot of credit," said Monez. "There's not a lot of people you can run right next to like that, not a lot of people you can run that clean with." It was the seventh week in a row that Monez had earned the fast qualifying time, and about the seventh week in a row that he was denied pole position due to the invert. 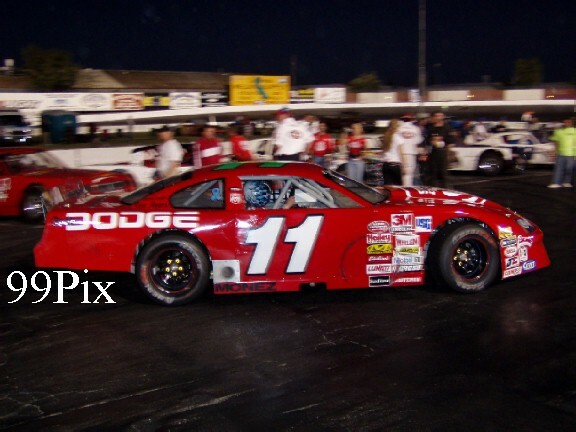 In the NASCAR DODGE Weekly Series win Monez started behind and alongside of some of the tracks toughest competitors. Stockton's Gary Shafer Jr. was next to him, just in front of him were division points leader John Moore of Granite Bay and Stockton's #5, Pete Anderson Jr. In front of Moore and Anderson Jr., in the second row, were Duncan and Chowchilla's Eric Humphries. Stockton's #24, Dwight Pilcher and Oakdale's Doug Rocha started up front. 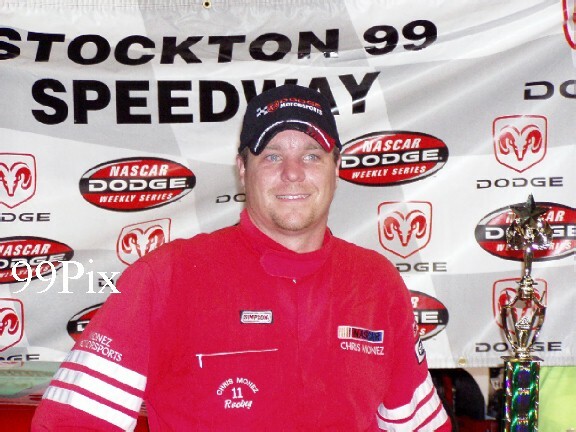 When the checkered flag waved Duncan came in second, Anderson Jr. finished third, Rocha came in fourth and Tracy's Brandon Trevethan rounded out the top five. 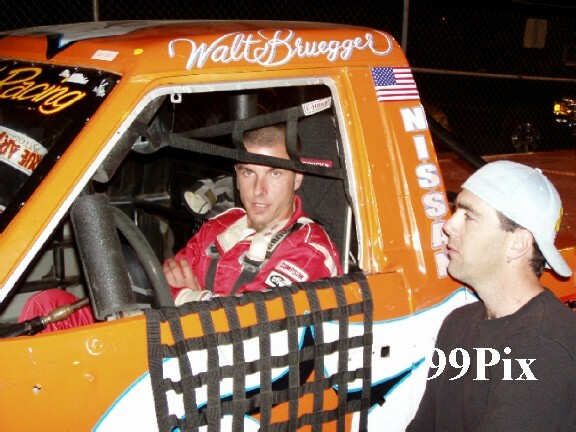 him at fourth but jumped him back into contention for the championship. 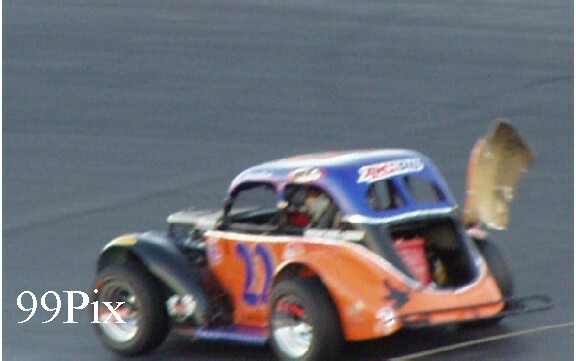 Shafer Jr. held at fifth with 517. Trevethan's (left) performance was noteworthy. 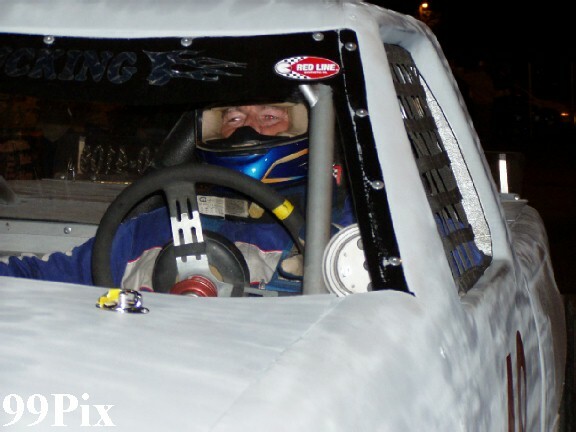 The WLM rookie came from a ninth place start along the way to his fifth place finish. Rocha's fourth place finish was his first top five performance of the season. 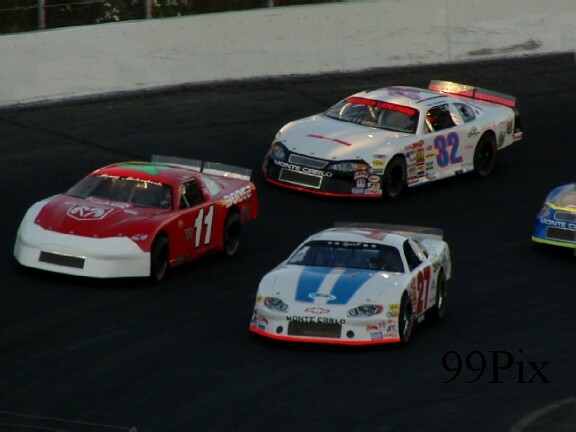 It was another action-packed night on the track during the CL BRYANT American Limited Stock Car main event! A five-position invert put fast qualifier #1, Joe Allen behind consistent track frontrunners #75, Chad Holman of Stockton, Darrell Hughes of Escalon, and Richard Harper of Stockton. But that didn't stop Allen from winning his fourth ALSC main event of the season. 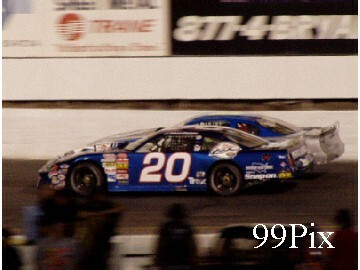 In lap-10 Holman made an inside move on turn-2 that nabbed him the lead spot while Allen and Stockton's Donny Darter (99) were battling it out for fourth position. 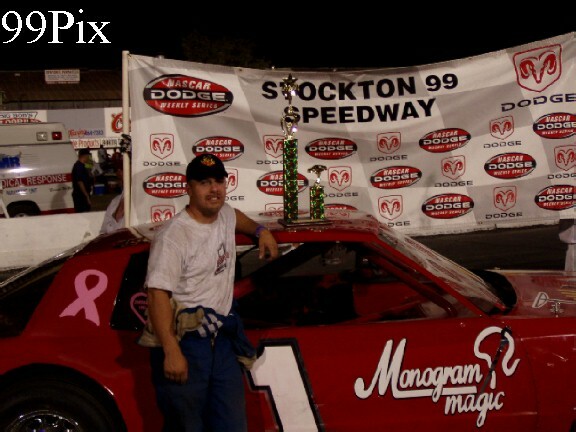 By lap-20 Stockton's Allen skillfully maneuvered around a couple of multi-car tangles, took the lead from Holman and ran clean through to his fourth ALSC main event win of 2005. Holman came in second, Hughes came in third, Darter finished fourth and Harper rounded out the top five. 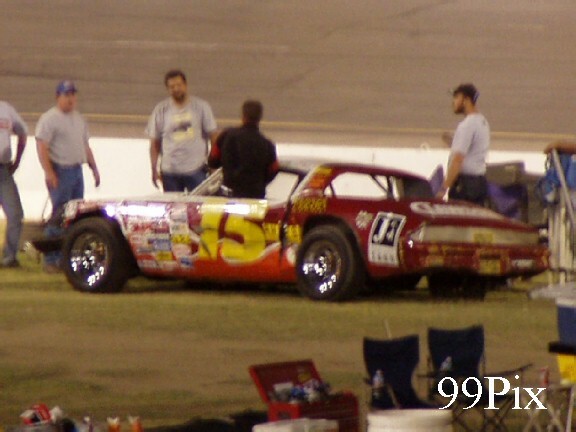 Points leader #15, Charlie Clawson of Modesto climbed the wall in the back stretch and was not able to finish the race. 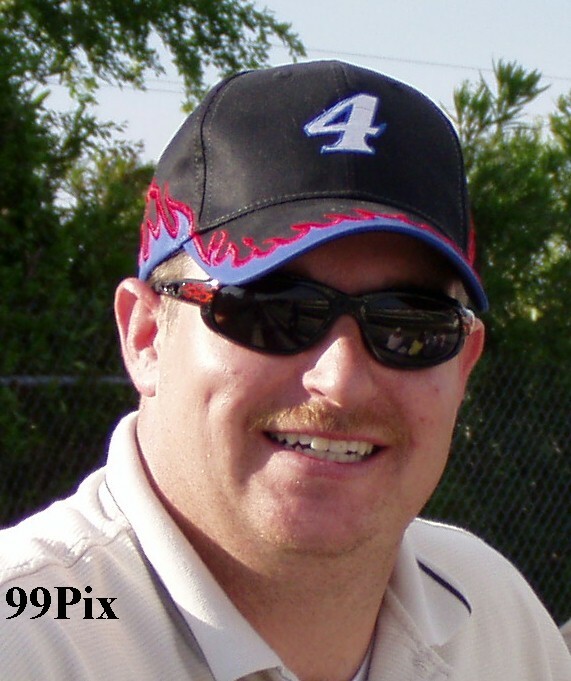 NASCAR race fans saw an exciting Pro-4 Trucks race. 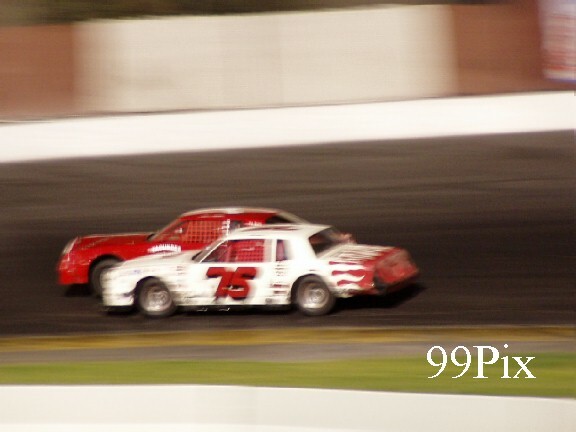 Division points leader #6, Mark Henslee, of Lathrop, started the race at the pole position, but when the green flag flew Milpitas' Ron Robeck, (left), jumped quickly into the lead, which he then held to the finish. 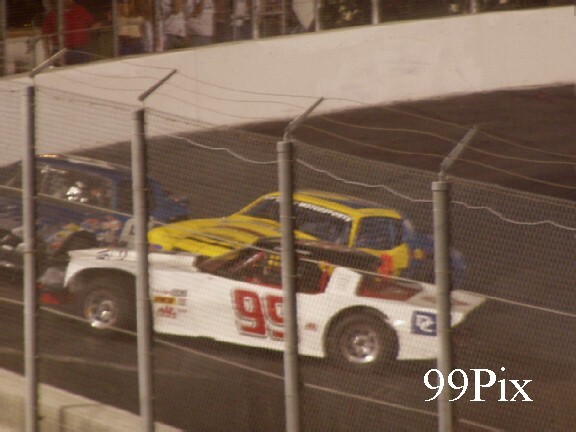 Before the race ended, Stockton's #48, Mike Curry, (left), passed five trucks to take second place, and Manteca's Brian Hitchcock passed four cars to earn third. Oakdale's Nathan McNeil earned fourth and Hayward's Walt Bruegger, (right), #67, finished fifth. 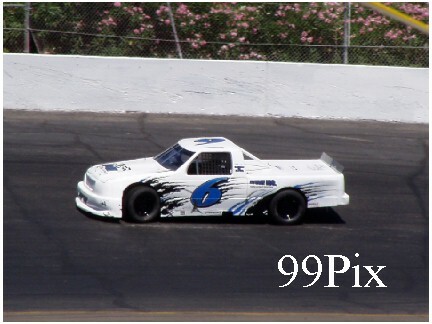 Despite his sixth place finish, Henslee, #6, held onto his points lead. He was behind the wheel of Hitchcock's number 38 super mini. 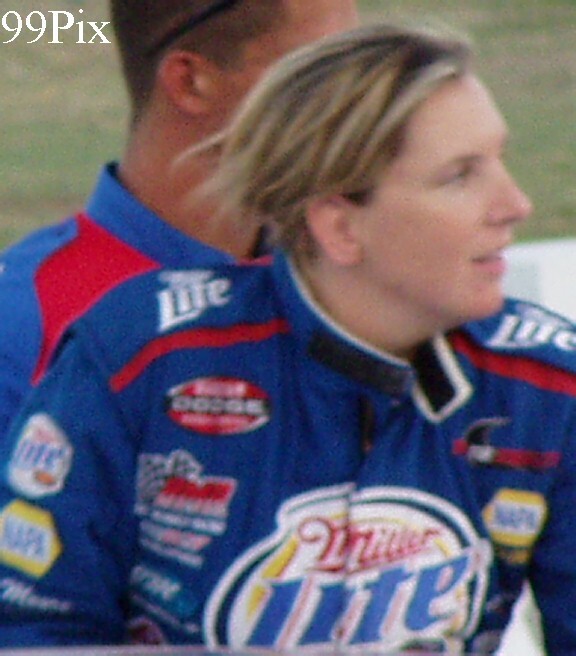 Hitchcock was behind the wheel of the his new ride, the former Miller Motorsports number 27, the truck that earned Stockton 99 Speedway fame when it carried Saratoga's Carrie Miller to two consecutive NASCAR championships. 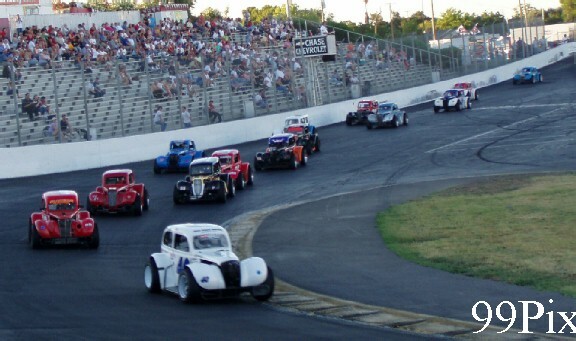 The Legends of the Pacific again visited Stockton 99 Speedway Saturday night. 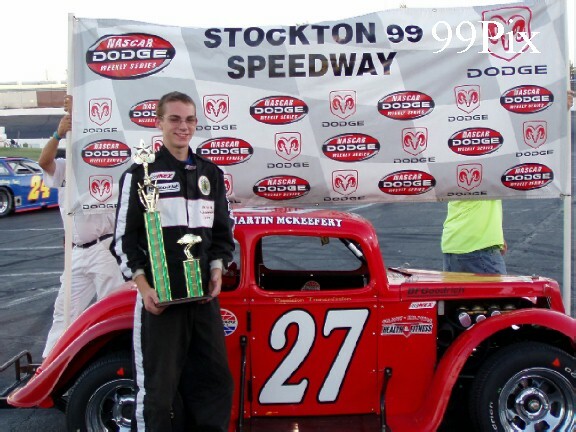 Milpitas' Seventeen year old Martin McKeefery, #27, again took the checkered flag. Tracy's Jeremy Wood, #22 earned second place, San Lorenzo's Mark Bailey took third, Lodi's Donny Stone finished fourth and Stockton's Fred Clement rounded out the top five. 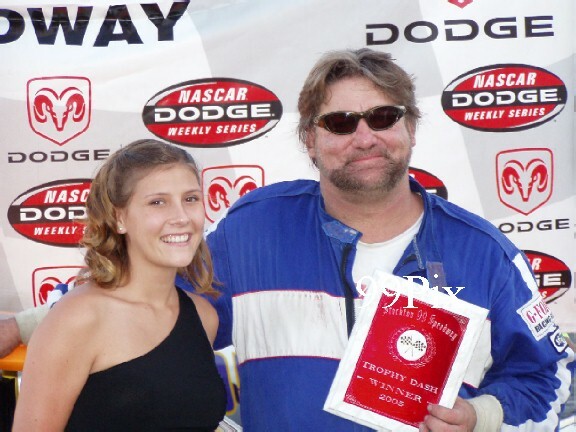 On Saturday, July 30 the Linden Lions Club will be at Stockton 99 Speedway for the "Night of the Lions." The action packed night of racing on NASCAR's fastest quarter-mile oval west of the Mississippi will include the HAVOLINE Western Late Models, CL BRYANT American Limited Stock Cars, Pro-4 Trucks and an exciting double-points 50-lap Grand American Modified race!